Overlooks along Grand Canyon's East Rim Drive are much less visited than those to the west with the exception of Yaki Point, at the end of a 1.5 mile side road that starts 2 miles east of the US 180 road junction, near the national park entrance. Several years ago, the small parking area by the rim was deemed to small to cope with the increased volume of traffic, so entry to all private vehicles was stopped and now access is either on foot - by parking on the main road at a nearby picnic area - or by shuttlebus. 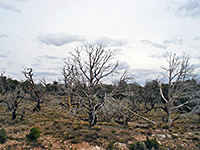 Yaki is the easternmost stop on the Kaibab Trail Route that also serves Pipe Creek Vista and the Canyon View Information Plaza at Mather Point. The restriction also applies to the South Kaibab Trailhead, located half way along the side road. The views at Yaki Point are rather different to the popular triumvirate of Grandeur/Yavapai/Mather points, all of which occupy the same promontory so look out over similar features. The westwards vista encompasses the end of the Bright Angel Trail, a section of the Tonto Trail and a fine view of much of the South Kaibab Trail as it descends along Cedar Ridge and O'Neill Butte. 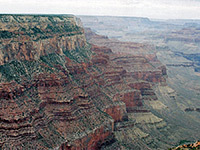 The view to the east includes Cremation Creek, running beneath another long red ridge centered on Newton Butte, and beyond (on the North Rim), the long drainage of Clear Creek enclosed by many high buttes and mesas.